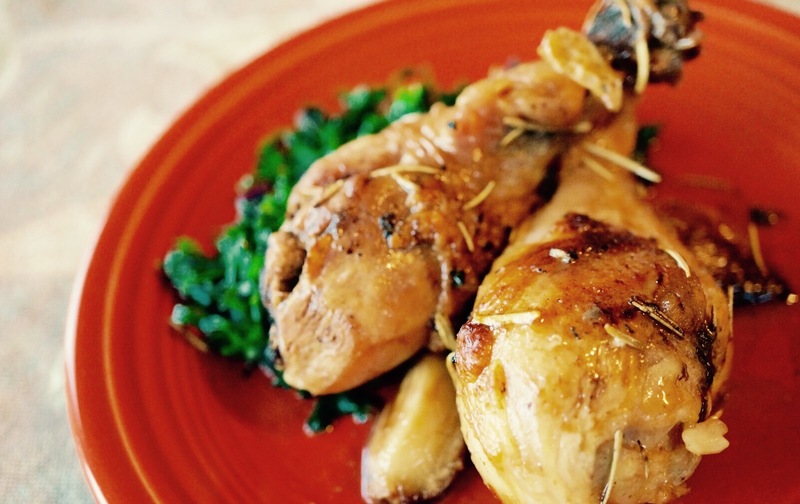 We love chicken drumsticks because they are very versatile, tender and juicy! This recipe is inspired on my favorite dish I would order at Cheesecake Factory when my husband and I used to go out to restaurants. The Lemon Herb Chicken is very flavourful but also a very simple dish. It pairs great with steamed, roasted or sauté vegetables or cauliflower “rice”! You can try substituting chicken drumsticks for breast or even pork. You can also substitute rosemary for oregano or thyme! In a bowl or marinator add chicken, kosher salt, rosemary, garlic powder, black pepper and lemon juice and let it marinate in the fridge for 1 hour (if not using a marinator). Once chicken has marinated, set the oven to 375F. In a skillet heat up ghee on medium heat and sauté garlic cloves until they are light brown. Brown chicken drumsticks all around for a couple minutes each. As you brown the drumsticks, place them in an ovenproof dish. Turn off the heat on the stove and add the remaining lemon juice from the marinator or bowl to the garlic and stir until well incorporated. Pour lemon juice and garlic on the chicken drumsticks. Bake for 45 minutes, turning the drumsticks over at the half way point. Serve with your favorite veggie!